1. 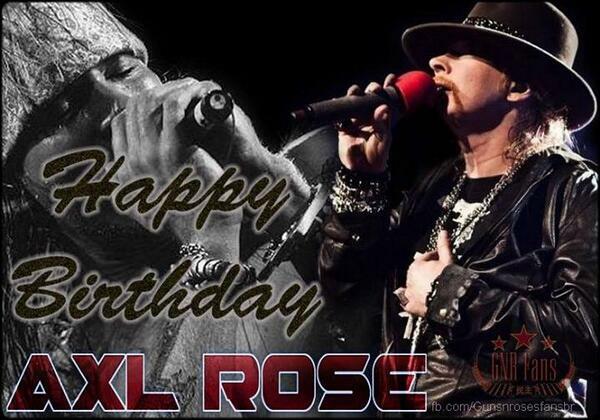 Axl was born William Bruce Rose, Jr. in Lafayette, Indiana. 2. When he was born, Axl’s mom was just 16 years old and still in high school. His dad was 20 and described as a “troubled and charismatic local delinquent.” The pregnancy was unplanned. 3. When Axl was two, his parents separated. His dad abducted him but his mom got him back and remarried Stephen L. Bailey, changing Axl’s name to William Bruce Bailey. Until he was 17, he believed Bailey was his biological dad. 4. Axl never met his real dad, who was murdered in 1984 by a criminal acquaintance. William Rose’s body was never found. Axl didn’t find out about the killing until years later. 5. Axl grew up in a very religious household. He went to three to eight services at a Pentecostal church every week and even taught Sunday School. 7. Axl sang in his church choir starting at age 5. He even performed with his brother and sister at church as the Bailey Trio. 8. In high school, Axl sang in the chorus and studied piano. He also formed a band with his friends. Among them, Jeff Isbell, who would later become Axl’s Guns N’ Roses bandmate and change his name to Izzy Stradlin. 9. At 17, after learning about his biological dad when he found insurance papers, Axl unofficially changed his name to W. Rose, not wanting to share a first name with his father. 10. In his teenage years, Axl was arrested more than 20 times in Lafayette for charges ranging from public intoxication to battery. He served jail sentences up to three months. In 1982, when the town threatened to charge him as a habitual criminal, he moved to LA. 11. In California, he formed a band called AXL that he was so into, his friends suggested he change his name to Axl. Just before signing a record contract in 1986, he legally became W. Axl Rose. 12. Another early career band Axl was in was called Rapidfire. They recorded a four-song demo in 1983. After years of legal action, it came out in 2014. 13. In 1983, Axl formed Hollywood Rose with Izzy, who moved to LA in 1980. Slash and Steven Adler later joined the band, which went on to merge with L.A. Guns and became Guns N’ Roses. 14. While trying to make it as a singer, Axl took on jobs like night manager at the Sunset Boulevard Tower Records. He also took part in a scientific study at UCLA, smoking cigarettes for a reported $8 an hour. 15. In the late 90s, Axl was considered a recluse, spending most of his time in his mansion in Malibu. 16. Axl has some interesting things in his home including collections of religious artifacts from Latin America and crucifixes, plus tanks of snakes, lizards and spiders. 17. Rose acts too – he had a small, uncredited role in the 1988 Clint Eastwood film The Dead Pool, playing a musician who attends a funeral. 18. In 1987, GN’R had a special visitor come by while they filmed the music video for “It’s So Easy” – David Bowie. However, before long Rose punched Bowie and booted him from the set for flirting with Axl’s then girlfriend, Erin Everly. 19. As any fan knows, Axl is rarely on time, and it is so bad the singer once told Rolling Stone that he wanted to put in his will that 30 minutes after his funeral begins, his coffin should show up with “sorry I’m late” embossed in gold on the side. 20. The rocker had a run-in with the law in 2006 when he was arrested for allegedly biting a security guard on the leg. 21. Axl voiced a DJ named Tommy “The Nightmare” Smith for the 2004 game Grand Theft Auto: San Andreas. 22. Believe it or not, Axl is a cat person. He has three tabbies named Dijon, Dexter and Whiskey. 23. Axl is a huge fan of Elton John’s music. 25. When Axl’s concert rider leaked in 2010, the world got an idea of some of his unique requests. Among them are two bear-shaped tubes of honey and seven kinds of cheese to be served in a black dressing room lit by six lamps and decorated with 18 white roses and 18 red ones.